URS's flagship processor hangs on to its 'classic' status with this solid update. Simple to use. Sounds excellent. Huge range of emulations. Blendable compressor mix. Super-fast attack option. No gate. LMF band could extend below 200Hz. The first URS EQ plug-ins quickly acquired a fanatical following and much praise for their sound. 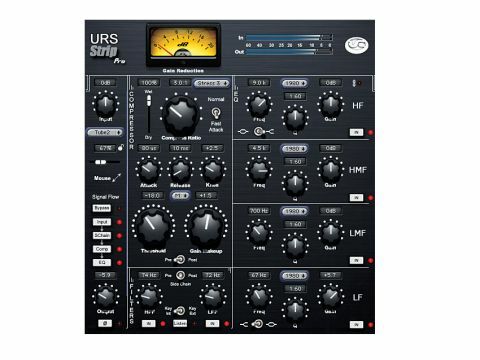 Like some Waves and UAD plugs, the URS EQs were surprisingly close to the analogue gear on which they were modelled, proving a viable 'stepping stone' for producers yet to make the transition to working fully in the box. Given the studio and R&D experiences of developer Bobby Nathan (he and wife Joanne ran the legendary Unique Recording Studios in New York), it really was only a matter of time until he made the conceptual leap that lead to the Classic Console Strip 1. "Don't be put off by CSS's apparent complexity - just tweaking the defaults yields great results." Some virtual channel strips (notably Metric Halo's) had already established themselves. What marked out the URS version as something even better was the obsessive modelling of each stage of the strip, and its dedicated input stage, which - in Bobby's own words - "sets the mood of the compressor". CCSP2 offers even more. If you've never used CCS before, let's first run through what you've been missing out on. There are many hardware devices prized for the sonic enhancement they provide. For instance, Neve, SSL and API consoles imbue a distinctive tonality, as do tape machines, whether they be 1/2" mastering machines or 2" multitrackers. CCSP2's input stage offers a stack of choices emulating the likes of these classics, and some offer combinations - ie, the sound of transformers and tape. So if you want your drum overheads to sound like they're coming back from a 1/2" tape machine running at 30ips through a Neve 1073 transformer input, you can have it. Importantly, if you've never used any of this archaic equipment or don't care for the slight nerdiness it encourages, you can still flick through the settings until you hit upon something that works for you. Apart from the input level control, the character of the input stage can be adjusted with the horizontal slider. This module of CCS alone would be a fantastic thing to use on every channel, but there's so much more to it. You can also choose your compressor: SSL, Fairchild, Distressor, LA2A, tape compression and more. They're all here, disguised under different names due to the usual legal/licensing issues. Select a compressor and the controls move to suitable 'starting point' positions. The most appropriate input stage model is automatically selected by default, though this can be disabled. By now, you may be thinking that you've been out-geeked, and that you'd rather have a simple two-knob compressor and be done with it. But don't be put off by CCS's apparent complexity - just calling up the presets and tweaking the defaults will immediately yield great results. So what's changed since v1 of CCS Pro? There's now an Input Stage Bypass button in the Signal Flow section, making it easier to A/B the subtleties of the flavours. The input stages have also been updated, with their characteristics now more obvious and distinctive. The new Input Stage Modelling Lock/Unlock button enables you to use different input stages with different compressor styles, whereas in v1 the two were intrinsically linked. The compressor has two very welcome additions. The Fast Attack switch changes the attack time range from 0.1-250ms to a fast 10μs-25ms, allowing Fairchild-like super-quick attacks. These are great for brickwall mastering settings, where you want transients eradicated completely, and also good in moderation for more transparent general mastering compression. Second, the new Wet/Dry fader lets you parallel compress within the plug-in, so you could mix your super-compressed drum sound with a little of the natural sound to restore some of its transient character, while upping the level of the general kit sound and ambience. This single fader saves you the hassle of creating a pair of parallel auxiliaries (ie, one clean and one compressed) and having to worry about phase or latency-compensation issues. Get ready for the nerdiness to ramp up even more. You can choose between several models of EQ, and while the original gear modelled isn't named, some of our educated guesses are Pultec (1951), API (1967), Neve 1073 (1970), Neve 1081 (1972) and SSL 4000E (1980). Each model has a definite character and you'll quickly come to know which you need. But here's the clincher: for each of the four bands of EQ, you can choose a different model. So you can use a 1951 Pultec-style band to add some smooth air up top while clinically zoning in on a problematic frequency in your lower mids with the SSL. There's also a section offering high and low-pass filters, which can be placed before or after the compressor or used for the internal sidechain. The compressor can be placed pre or post-EQ, and a signal flow diagram offers an overview of the current routing. This plug-in is a simple yet very powerful way of introducing warmth and character to your mixes. Running through the compressor presets alone offers real sonic alteration before you even touch the EQ. If it had a gate, you really could get by with this as your only EQ and dynamics machine. How about it, URS? The CCS Pro comes bundled with a DSP-efficient cut-down version, the Strip, and given that the Pro version isn't greedy in this respect, you could have Pros on all your key tracks and master busses and Strips on everything else without maxing out your system. Both plug-ins work at up to 192kHz and there's also an external sidechain option for CCS Pro. If you're a V1 owner, it's a free upgrade, and if you're not, then we highly recommend the CCS Pro 2 for adding top quality analogue warmth and character to your mixes.